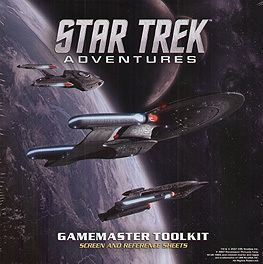 The Star Trek Adventures Gamemaster Toolkit gives the Gamemaster all the rules references they need to run a mission into the Final Frontier, right in front of them. It also gives players reference sheets for each of the roles in Starfleet and on the bridge of a Federation starship. A giant Gamemaster screen, packed with rules for the 2D20 system and reference tables needed during play. An A2 sized map of the Alpha and Beta Quadrants, with poster artwork on the reverse. This product requires the Star Trek Adventures core rulebook to use.